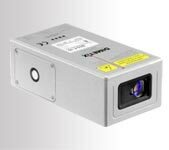 "FLS-C" for Fast Laser Sensor. One of the most remarkable performances on industrial distancemeters market. The new FLS-C laser provides not only more accuracy but also a measurement rate, which will meet requirements of any dynamic application needing both accuracy (+/1mm*) and rapidity (50ms*/measure). The quality of engineering of this sensor is the same as the whole range of Eurolase. This new sensor is undoubtedly the solution for industrial needs, with high level demands concerning measurement rate and accuracy, either on natural material or on reflector (up to 500m*), indoor or outdoor. Its new SSI interface together with the previous ones (analog, RS 422, RS 232, field Bus) ensure compatibility with the major portion of industrial PLCs. *Performances achieved with the most favourable conditions.